With an instrument at the Very Large Telescope in Chile scientists of ETH Zurich observed planet-forming disks around young stars similar to the sun 4,5 billion years ago. Surprisingly, the disks are very different. The data will help to shed more light on the formation processes of planets. An instrument, which was partially developed and built at ETH Zurich, has now been particularly successful at studying new born stars still surrounded by gas and dust. With SPHERE (Spectro-Polarimetric High-contrast Exoplanet REsearch) at the European Southern Observatory (ESO), astronomers of ETH Zurich and Max Planck Institute for Astronomy in Heidelberg were able to take images of planet-forming disks around the young stars: these disks, called protoplanetary disks, exist around so-called TTauri stars – the progenitors to our Sun – as well as around the more massive siblings called Herbig Ae/Be stars. So far astronomers focussed mostly on Herbig Ae/Be stars in their studies, but with a new, ambitious program called DARTTS-S (Disks Around TTauri Stars with SPHERE), Henning Avenhaus and Sascha Quanz, former and current members of the NCCR PlanetS at ETH Zurich, have now been able to use the capabilities of SPHERE to undertake a survey of TTauri disks. The results for the first eight stars are released in a paper published by the Astronomical Journal. 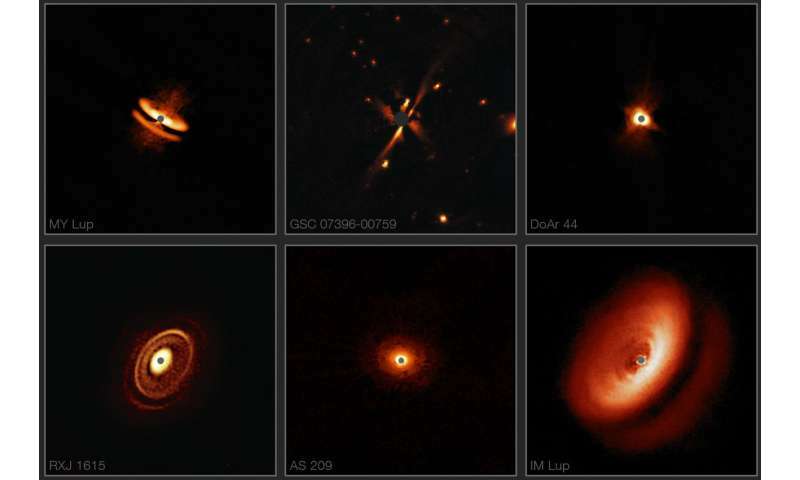 "Not only were we able to clearly detect all eight disks," summarizes Henning Avenhaus, "but, surprisingly, they looked all very different in particular with respect to their size." While some of them could only be detected with a radius of 80 au (80 times the distance Sun-Earth and about twice the average distance Sun-Pluto), others could be traced out to an astounding 700 au. "Most of the disks were found to display rings, a phenomenon known from previous observations of more massive stars," explains Sascha Quanz: "However, none of them displayed spiral structures, which is a phenomenon seen regularly in Herbig disks." A key question is now to understand where this difference is coming from and what it means for planet formation around different types of stars. As successful as the project was, it started on a bad footing, as Henning Avenhaus remembers: "While the first proposal to undertake such observations was already written in March 2013 and highly rated (back then using the older NACO instrument), unexpected works that had to be performed on the instrument made it impossible to take data." The same happened again in September 2013. Again, the instrument was not available. A third attempt in March 2014 did yield the requested scheduling—in March 2015, when Henning Avenhaus flew to the telescope just to find out that the instrument (still NACO) had a malfunction the night before the observations were scheduled to start. Not that it mattered: Wind and clouds made it impossible to observe anyway. At this point, the team decided to switch to the new instrument—SPHERE—and got their first observations scheduled in March 2016. This time, it worked: Both the instrument and the weather were well-behaved, as Henning Avenhaus remembers: "I was present at Cerro Paranal, the location of the Very Large Telescope, working through the nights to perform the observations and occasionally peaking out of the control room to head to the telescope platform and marvel at the impressive display of stars." The data taken over the course of several nights in March 2016 and in the following year were of very high quality. More than five years after the idea for the program, the researchers are now rewarded with results that will help to shed more light on the formation processes for planets. "This high-quality dataset impressively shows the power of SPHERE for these observations and significantly increases the number of planetary nurseries studied at high resolution enabling us to eventually get a statistical grasp on planet formation," summarizes Sascha Quanz. Further results of the DARTTS-S programme and similar observations with the ALMA radio telescope in Chile should contribute to this. Planets also can have disks. Is that where moons form? As per usual one has to carefully scrutinize and distinguish between what has actually been observed and what has been inferred and interpreted. "new born stars surrounded by gas and dust"
There is currently no justification to attribute the observed clouds of dust and gas with planet forming capabilities. No such planet forming process has EVER been observed and in reality is contrary to known simple physics. We can stare at the moon and yet we can't see it moving, although we know it does. How do we know the moon moves Fred? Cognition 101. The reason why religion is doomed. We can actually perceive its failing because it is a quantum process, the sum of discrete events great and small, like postings from people like you, or the pope declaring that hell no longer exists. Or the discovery that Nazareth didn't exist during the time of Christ. Etc. Big steps, little steps. Like Saul on the road to Damascus. Fred, what evidence would you want to see that would change your mind and allow you to accept that this is indeed the precursor to a planetary system forming? What is the known physics that contradicts accretion? Solon & FJ, the mechanism is called Gravity. You know, that attractant force that keeps you from floating away? "There are several ongoing processes with disks of rocks and ices. Big rocks grow bigger by attracting little rocks." If these rocks have electrical charge then they would repel at short distances, not attract, and be spread out much like the asteroid belt objects. In which case, they obviously don't. Solon, you must have a nifty job replacing the spent batteries in all those gazillions of rocks. I hope you are being environmentally responsible and utilizing rechargeable batteries? mackita, Titus Bode? Really? Why not suggest inserting an oxen femur into a fire and then reading the cracklings? Modern observation has totally contradicted those primitive suppositions. With modern observations all too vividly displaying that that this universe is a chaotic mess of Stupid Design. TB now stands for Totally Bogus. "Solon, you must have a nifty job replacing the spent batteries in all those gazillions of rocks." I'd imagine the ionising radiation from the young stars would be able to charge all those surrounding rocks and dust. Solon. instead of "imagining" how you fantasize a physical process might work? How about producing physical evidence with repeatable, verifiable experiments? mack, if you gave me a world map created in the sixteenth century? What I know of geography and with just a military-grade magnetic compass? I could confidently walk from North Africa, through the Levant into Central Asia. Or, make a left at Beirut, crossing Anatolia into Europe as far as the Channel. Titus-Bode does not qualify as a Universal Law. Their observations showed an orderly Solar System. They assumed this was true for the Cosmos, At best T-B is a roughhewn measurement tool. Out of the thousands of observed star systems to date. How many actually match up to the orderly stability of our star system? And double-check that the guy measuring in feet gets his figures reconciled with the guy measuring in meters! A few decades ago, a cousin visiting from back east, who ran a trucking company. Was expressing his envy of a new Thomas Guide, I was using. He complained that all they had were unreliable gas station maps. And today? We have the magic of GPS. Please do provide us with the documented and widely published observation that planets can indeed form from a cloud of dust and gas. Do provide us with the observable and repeatable physics experiment that describes such an incredible event of accretion happening in the vacuum of space. Until such time as you actually provide real, documented, published and peer-reviewed, observed evidence of this accretion process I'll happily go around telling people the truth: It does not exist! Right; what is the alternative hypothesis that you are suggesting, and where is the experimental evidence? And the documented, published and peer-reviewed papers in favour of it? Go. Some years ago it was suggested that planets formed out of the material surrounding young stars. That is, gas, dust, rock, ice. At the time there was no evidence for such material around young stars. Now there is. Which supports the theory, but doesn't prove it. With the advent of ALMA it was possible to see these disks in great detail. Theory would suggest that planetary formation would leave gaps in the dust disk. That is indeed what is seen. This supports the theory, but doesn't prove it. So, the evidence looks pretty good for the theory. Unfortunately, although these planets form in the blink of an eye, relatively speaking, it still takes 10s of thousands of human lifetimes. Observation is the solution, now were looking at the trillions of planetary formations, we will see every stage of construction of the various stage from Suns evolving to the final stage we have reached today, but have we observed sufficient stages to fill in the gaps, can we see a planet the size of earth 50,000 light years away optically. The alternative being some bearded dude in flowing robes wandering about the cosmos with a Divine Do-It-Yourself Universe Kit? "… a bizarre variety of shapes, sizes, and structures, including the likely effects of planets still in the process of forming." It can be assumed that the observed discs are at different stages in the evolution of the formation of planetary systems, which takes place during billions of years. Deities, drunk with stochastic omnipotence. Are the cthonic causation of Stupid Design. And please in all fairness do the same with all unverified and unsubstantiated claims that your wondergod has anything to do with it. Including your unavoidable conclusion that he doesnt exist for exactly the same reason.